Correct answers were submitted by: Scott Webster, Steve Chess, Tom Hammitt, Larry Harmacinski, Don DeVoe, Larry Cole, William Naumuk, Mike Brown, Lynn Towns, Robert Still, Michael McCormick, Hugh Metzler, Hank Dahl, Darrel Toepfer, Charlie Tilghman, Stuart Bain, Bill Bosma, Wayne Muxlow and Evan Phillips. William Bushnell Stout, was born at Quincy, Illinois on 6 March 1880, to Rev. James Frank and Mary (Bushnell) Stout. He was thus, the great-grandson of David Bushnell, the American inventor of The Turtle, a pioneer submarine used in the failed attack on HMS Eagle; Lord Richard Howe’s 64-gun ship-of the line, on 6 September 1776. While America’s first submariner, Sergeant Ezra Lee, was unable to attach the clockwork-detonated bomb to the hull, it nevertheless forced the relocation of the ship in New York harbor, away from Bedlow Island. In 1898, Stout matriculated from the Mechanical Arts High School at St. Paul, before attending Hamline University, where he studied from 1899-1900. In his sophomore year, Stout transferred to the University of Minnesota to study Mechanical Engineering. Unfortunately, severe myopia prevented the continuance of his studies, and he was forced to end his college career, studying only from 1901-1902. He traveled to Europe in 1903, before writing illustrated articles for Cassell’s Magazine and Harmsworth, Minn. newspapers. He then became Instructor of manual training at St. Paul Central High School. Nevertheless, on June 15,1906 (1), he married Alma E. Raymond of Kingston, Ontario. In 1907, Stout became Chief Engineer for the Schurmeir Wagon Co. (apparently it later became the Schurmeir Motor Truck Co.) located at 29 Western Avenue; Minneapolis, Minn. The company only lasted a few years from 1907 to around 1911, and Stout became the autombile editor for the Chicago Tribune. In 1908, Stout again toured Europe, this time by motorcycle. In June of 1912, Stout founded the Chicago aviation periodical: Aerial Age (not to be confused with the latter periodical of the same title published in New York, New York from 1915). The periodical lasted only a few months, ending in 1913. It has been erroneously asserted that Stout’s publication was the first American aeronautical periodical. That honor belongs to; Aeronautics, published by the American Engineer and Railroad Journal; volume 1, number 1, appearing in October 1893. This was soon followed by James Mean’s Aeronautical Annual, published in Boston from 1895-1897. The Aeronautical World, published at Glenville, Ohio, followed, in 1902-1903. Subsequently, The Aeronautical News, ran a single issue in May 1906. Ernest LaRue Jones, can rightly be credited as starting the first genuine aircraft periodical. Tentatively titled: The American Magazine of Aeronautics, publication began in July of 1907 and ran into 1915, when the title was then, simply: Aeronautics. Again, this should not be confused with the U.K. periodical of the same title. While still writing for the Chicago Tribune (where he served as Technical and Aviation Editor and covered the 1911 Chicago International Air Meet), Stout supplemented his income, writing under the nom de plum, “Jack Kneiff” (he is said to have thus been nicknamed; “Jack Knife,” by some of his friends). He used this assumed name as early as 1903, writing for the St. Paul Dispatch. Stout, had a life-long interest in model building. During 1904, Stout wrote an article for the St. Paul Dispatch, advising boys on how to build “aviation toys” (2) In 1907, Stout claimed to have given the first lecture on aviation for the Engineering Societies of Minneapolis and St. Paul. He also is said to have formed the Model Club, of the Aero Club of Illinois. As late as 1914, he was apparently still using this alias, writing for the Minneapolis Times. At some point, Stout also joined the staff of the periodicals Motor Age and Automobile. It was during 1914, that Stout began working for the Scripps-Booth Co., at Detroit, Michigan. James Scripps-Booth produced a type of cycle-car, in essence, a small car usually powered by a vee-type motorcycle engine. In this case, a Spacke two-cylinder engine was used with a two-speed planetary transmission; the final drive being via twin leather belts. Stout, was apparently responsible for the design from 1914. Approximately 400 were sold by the end of 1914, at a price of $385.00. Scripps-Booth had succeeded the 1913 Rocket Cyclecar, becming the Scripps-Booth Co. in 1914. It was subsequently absorbed into the Sterling Motor Co., being reorganized as the Scripps-Both Corp. Eventually, Scripps-Booth produced a number of “cyclecars,” the Model D, perhaps, being the best known. Eventually, the company became part of General Motors in 1922. It is said that Alvan MacCauley brought Stout into the Packard Motor Car Co. in 1916, first, as Manager, advancing to General Sales Manager, before finally heading-up the Aviation Division, as Chief Engineer. Stout was hired by Packard on ! December 1916 at a salary of $600.00/month. Stout, did not remain at Packard for long, he left in August of 1917; to become an Technical Adviser to the Aircraft Production Board, part of the Council of National Defense, headed by Howard E. Coffin. Stout’s activities at Packard, are thus, somewhat unclear. Packard, designed a solitary two-place biplane immediately after the First World War, and was eventually selected to produce the LePere LUSAC-11 (LePere USA Combat Model 11) in 1918. The LUSAC had been designed by Captaine Georges LePere, and engineer serving with the French Military Technical Aeronautical Service, arriving in the United States in January 1918. In any case, the post-war Packard “1A Biplane” was powered by a 1A engine, stated have produced 160 hp (@1,525 rpm). However, scrutiny of the pages of Glenn D. Angle’s Airplane Engine Encyclopedia, indicate that it was undoubtedly a 180 hp (@1,600 rpm; 200 hp at 2,000 rpm) Model 744; a 60 degree, water-cooled V-8 of 744.24 cubic inch displacement. As it was, the 1A Biplane was one of many post-war “sport-Plane” designs that did not see mass production. Like other aircraft designed for the civilian market, Packard had not counted on numerous, and relatively cheap, war surplus aircraft, such as the Curtiss JN-4D/H and Standard J-1. Prior to the 1A, or Model 744, Packard has extensively tested a 299 cubic inch, water-cooled, V-12 at Sheepshead Bay, New York, in an racing automobile during the late winter and spring of 1916. This engine was limited to around 100 hp (@ 2,300 rpm), but was intended to be an aircraft engine. While the 299 cubic inch V-12 did not see use in aircraft, and only two were built; the next Packard wartime engine, the Model 905 of 225 hp, also saw extensive ground testing from a platform on the back of a 5 ton Packard Model E truck. In all, three Model 905s were built, the 1A 905-1, !A 905-2 and 1A 905-3. The 905 was tested on a dynamometer on 17 December 1916, and was publicly demonstrated on 28 December. These tests were witnessed by a number of important individuals, including Howard E. Coffin, serving on the Council on National Defense, and Capt. James Vernon Martin, the first man to fly an airplane in Alaska, inventor of the diminutive K.III Kitten scout biplane, and holder of a lateral control system tested on a Curtiss JN-4D. As Packard developed the 1A 905 series, Elbert John Hall was developing a series of engines for aircraft use. A self-educated mechanical engineer, Hall completed an International Correspondence School (I.C.S.) course in steam engineering in 1900. He began his design experience at the Henshaw-Buckley Co. at San Francisco from 1900-1905, before moving into automobile design at the Heine-Velox Co., from 1905-1906, the year of the great earthquake. The following year, Hall became manager and general designer for the Comet Automobile Co.; finally, forming the Hall-Scott Motor Car Co. with Bert C. Scott. Originally, the company intended to build interurban rail car bodies, locomotives and cars. However, by 1910, Hall-Scott constructed its first aircraft engine, the A-1, a four-cylinder water-cooled inline. Meanwhile, Jesse G. Vincent, also a self-educated mechanical engineer, also completed and International Correspondence School course during 1902. He became Superintendent of Patent at Burroughs in 1903, and became Chief Engineer at the Hudson Motor Car Co. in 1910 before finally moving to Packard in 1912 as Chief Engineer. Vincent, was promoted to Vice-President and Chief Engineer at the Packard Motor Car Co. in 1913; a position which he held until his enlistment in the U.S. Army in 1917. It was the wartime need for a powerful modern engine that led to the instigation of what was to become the Liberty engine. The National Advisory Committee for Aeronautics was formed as a rider to the 1916 Naval Appropriations Bill. In mid 1916, the Council of National Defense was formed. The head of the board, Howard E. Coffin of the Hudson Motor Car Co., was assisted by Sidney Waldon, former vice-president of Packard, and then employed by the Cadillac Motor Car Co. Following the U.S. declaration of war on 6 April 1917, the Secretary of the Navy formed a joint technical board on aircraft. Originally, the board consisted of Maj. Benjamin D. Foulois (Chairman); along with Capt. V.E. Clark, U.S.A.; Capt. Edgar S. Gorrell, U.S.A.; Lt. A.K. Atkins, U.S.A.; Lt. John H. Towers, U.S.N. ; and Lt. Jerome C. Hunsaker, U.S.N. The Army and Navy Joint Technical Board on Aircraft, was renamed the; Aircraft Production Board on 16 May 1917. Members of the new board were; A.C. Cable, Sec. ; R.L. Montgomery, Sidney D. Waldon, Edward A. Deeds, Rear Admiral, David W. Taylor; Brigadier General George O. Squier; and Howard E. Coffin, Chairman. Squier was chosen because he was Chief Signal Officer for the army, which then oversaw army aviation. Rear Admiral Taylor was Chief Constructor for the U.S.N., and R. L. Montgomery was a prominent Philadelphia lawyer and senior partner at the law form of Montgomery, Clothier and Taylor. He was to act as financial advisor to the group. Sidney D. Waldon was a long-time aviation enthusiast, and had been commissioned as a Capt. in the aviation section of the Signal Corp. He was also vice-president at Cadillac from 1913-1915. Edward Deeds, general manager of the National Cash Register Co. and President of the Dayton Engineering Labratories Co. (DELCO), was a friends of the Wright Brothers, and had formed the Dayton-Wright Company out of the ashes of the old Wright Co. with Charles F. Kettering, Henry E. Talbot and H.E. Talbot Jr. While the complex events leading to the production of the Liberty aircraft engine are much to lengthy to discuss here, the reception of the French and British military missions in April of 1917, eventually led to the development of the Liberty 12-A. The concept of a standardized engine, largely attributed to Vincentis recorded in his two seminal works on the subject; History of the Development of the U.S.A. Standardized Aircraft Engines and The Liberty Engine; Design and Development, is supported by his extensive record keeping and the book; History of the Liberty Engine, by First Lt. Harold E. Porter. On 29 May 1917, Hall returned to Washington, D.C., and was asked by Deeds to join Vincent at his suite of rooms (Suite 201) at the Willard Hotel. By mid-day, they had made the primary decisions and began the layout drawings of the eight-cylinder Liberty. They contacted the SAE (Society of Automotive Engineers) for a draftsman, but ended up acquiring two drafting tables and instruments. After a visit by the French and English missions, which answered many technical questions about European aircraft engine design, Hall drafter the longitudinal sections and Vincent the transverse. The following day, Mr. Zimmerschied was able to supply a Mr. Schoonmaker to assist with the drafting. Although he had not been a draftsman for some time, he nevertheless, threw himself into the workof creating the formal drawings, which were largely complete by 31 May. It had been 48 hours since the work had begun, and the drafting and report was complete. At about 3:00 pm. Sidney Waldon took Vincent and Hall to Gen. Squires’ office where approval was given to start construction. Originally proposed as 4, 6, 8 and 12 cylinder designs, the first Liberty engines, built by Packard, were known as the U.S.A. 8. Delivered to the Bureau of Standards at Washington, D.C. on 3 July 1917, the design of the cylinders would differ markedly from the later standardized L-8 production engine. Arriving at the Packard factory at Detroit on 1 June; Vincent, Hall, Schoonmaker and two layout men began accurate layout drawingf of the eight-cylinder engine, which was completed by 4 June 1917. A meeting held at midnight with the Aircraft Production Board and the Joint Army Navy Technical Board, Deeds instructed Vincent and Hall to build 5 eight-cylinder and 5 twelve-cylinder engines. They were to be built by Packard as quickly as possible, the eight-cylinder being first. Returning to Detroit, Vincent sent his layout men to do detailed drawings of the crankcase and cylinders. Vincent took Packard President, Macauley, with him to Washington to see Deeds, where a conference was held on 6 June. A sundry of companys were responsible for manufacture of various engine components. By July 26-26 1917, U.S.A. No. 2 was running on the test stand at Packard, while No.1 continued to be tested in Washington, D.C.
By the late summer, the third engine was to be flight test in an L.W.F. (Lowe, Willard and Fowler) Model F (A.S. 2505) at Mineola Field, New York by 12 August 1917. The original wooden pattern molds were used by L.W.F. at College Point, New York to construct the engine mounts. Various problems with the high-compression pistons resulted in delays with the Liberty 8, however, by August the first tweleve-cylinder Liberty was on the test stand at Packard. It was about this time that Admiral Taylor apparently bestowed the name, Liberty, and on 29 November 1917, a trademark was applied for in the name of the United States of America. Work progressed rapidly now, the L.W.F. made its first flight on 29 August, and the first Liberty 12 completed its 5 hour test on 22 August 1917. An aviator named Blakely made the first 20 min. flight with no problems. This was witnessed by Mr. Flint of L.W.F. and Mr. Crane of the Crane-Simplex Co. Waldon, now a Col., arrived with Maj. Horner on 26 August, and an army pilot named Kilner, made the first flight in the L.W.F. by a military officer. While testing went on, the first Liberty 12A, or L-12A (Exp. No. 3) did not fly until 21 October 1917 in a U.S.N. Curtiss HS-1 flying boat. The fourth experimental L-12A was fitted to the prototype Dayton-Wright DH-4 Liberty Plane, the American version of the DeHavilland D.H. 4. This aircraft made its first flight on 29 October with Howard Rinehart as pilot. The aircraft was preserved after 1,078 hrs of flight testing and is currently on display at the National Air and Space Museum (NASM) at Washington, D.C. Orville Wright is known to have flown as a passenger in this machine with Rinehart at the controls. Eventually, large numbers of twelve-cylinder Liberty engines were built, along with highly limited numbers of six-cylinder constructed by Thomas-Morse at Ithaca, New York, and four-cylinder engines built by the Hudson Motor Car Co. at Detroit. A double crankshaft version of the Liberty would be built, post-war, along with a number of other versions; including, a version with a geared propeller drive, supercharged versions, and inverted air-cooled conversions. The Liberty would become one of the most versatile engines of the twentieth century, some being used in speed boats, and tanks. Not finally being withdrawn by the British military until 1960, the same year the Royal Army finally abandoned the Vickers heavy machine gun. The Liberty would make many notable records during its use. It was the engine that powered the Navy-Curtiss N.C. 4 on it’s transatlantic flight in 1919. The Fokker T-2 would make the first non-stop transcontinental flight across the United States in 1922. It would also be the engine used by the Douglas World Cruisers on their trans-global flight of 1925. Following Stout’s departure from Packard, he became technical advisor to the Aircraft Production Board. In 1918 he apparently became assistant to the Chief Engineer of the U.S. Army Air Service at McCook Field. By this time, Stout had written article discussing the virtues of wooden construction versus the use of duralumin (3). It was at McCook Field that Stout managed to obtain a 150 hp Wright-Martin (Hispano-Suiza) engine from C.W. “Charlie” Nash. Referred to as; The Bat, or S-X-7, few details have survived. Records indicate that the aircraft apparently made short hops, but no true flights. Stout claimed that it was the first cantilever wing aircraft built in the United States. Indeed, this may be true. The actual covering was of wooden veneer skin. A short article found in an issue of the Kelly Field Eagle, indicates that the span was about 39′, and another source gives the gorss weight as 1,800 lbs. No other statistical data has apparently survived, and only 5 photos exist, which show the odd trapezoidal wing planform, and obviously poor cockpit visibility. The pilot was named Jimmy Johnson. Early Stout design, the Bat Wing. Note Jenny style radiator nose. The Bat Wing Limousine, was a three-place machine (another source states that it was five-place), with room for two passengers in the cabin aft of the open cockpit. The Weight was 1,820 lbs., and the VMax. 125 mph, with a landing velocity of 43 mph. The nose radiator was fitted with shutters to control the cooling. The short-coupled fuselage and distinctive trapezoidal wings were topped by a conventional empennage, although closely spaced behind the shoulder-mounted wing of 36′ span. As early as the 1920 Flight article on the Bat Wing, mention was made of U.S. Navy interest in Stout’s work. His next design was the ST-1 (Stout Torpedo One), a revolutionary all-metal (duralumin? This isn’t clear) low-wing monoplane. While some doubt has been expressed about the materials used, Stout’s own AIAA application states: “1922 developed all metal torpedo plane for U.S. Navy.” At Packard, the design philosophy of developing larger twelve-cylinder designs from eight-cylinder types, resulted in the !A-1116. Developed from the 1A-744, the 1A-1116 produced 282 hp @ 1,600 rpm. This was followed by the 1A-2025, Producing a maximum output of 585 hp @ 2,000 rpm, this engine powered the Verville VCP-1 to first place in the 1920 Pulitzer. The next Packard engine of note was the 1A-1237. The Model 1237 (1236.96 cubic inches) had a .25″ increase in bore which resulted in an increase in the compression ratio to 6.5:1. With a total bore of 5″ and a stroke of 5.25″, the engine developed 315 hp @ 1,600 rpm, and 374 hp @ 2,000 rpm. The dry weight was 737 lbs. Unlike the 1A-1116, the ignition was supplied by magnetos. This engine, described in one contemporary article as the Packard “Altitude Engine,” was intended for high altitude work, and at one point was apparently considered to have become the next standard engine for pursuit aircraft. A Dayton-Wright XDH-4L (A.S. 64593, Project 193), was among the first aircraft fitted with a !A-1237. The Loening PW-2B, Gallaudet PW-4, Aeromarine PG-1, Engineering Division TW-1, Engineering Division (Orenco) PW-1, and Naval Aircraft Factory NM-1 (A6450/6451); were all intended to use the 1A-1237, in addition to the Stout ST-1. Today, only a single 1A-1237 survives in California, where is was used in a racing boat. 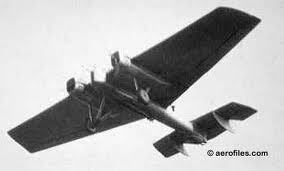 In flight photo of Stout ST-1 showing torpedo attached under fuselage. It is unclear if the ST-1 was actually built of duralumin, or was steel tubing covered with duralumin. 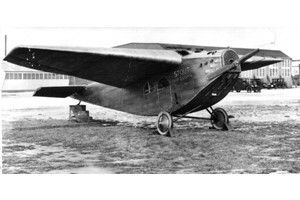 Certainly, Hugo Junkers F.13, imported to the United States as the Junkers-Larsen JL-6, was well known by 1922, the aircraft being purchsed by the U.S. Air Mail and U.S. Navy. It is unfortunate that during the 1980s, the logbooks of most of the experimental U.S.N. aircraft were “recycled” by the National Archives and Records Administration (NARA). Nevertheless, it is possible that drawings of the ST-1 have survived, thanks to the efforts of Mr. Phil Edwards, the Technical Information Specialist at the National Air and Space Museum (NASM), who saved most of these priceless drawings from destruction at Cheatham Annex in 1973. The drawings are currently held by NARA, and there is a considerable fee to have a drawing “pulled.” Unfortunately, no drawings exist prior to the Naval Aircraft Factory N-1 of 1918. Stout ST-1 made its maiden flight April 25,1922 with Eddie Stinson the test pilot. As it was constructed, the ST-1 was a two-place machine. The main weapon was an 18″ Bliss-Levitt Mk. VIID torpedo. Weighing 1,036 lbs. (one source states 1,032 lbs. ), it carried 200 lbs of TNT over a range of 2,000 yards at 35 kts. The length of the Mk. VIID was considerably shorter than a standard Mk. VII, being 11′ 7.75″ in length, as opposed to 17′ 0.75.” The Mk. VII was the first U.S. steam torpedo, and the VIID, was the first U.S. aircraft torpedo, a total of 36 being built, and the first tests drops taking place from a Curtiss R-6L. Photos of the ST-1 also show a gun pit about half way down the fuselage. Presumably, the standard twin Savage Arms .30-06 cal. Lewis guns were to be fitted, as a scarff ring mount was fitted. The surviving statistics of the ST-1 show that it had a span of 60′, and overall length of 37′, and a height of 14.’ The empty weight was 6,557 lbs., and the gross weight was 9,817 lbs. The total fuel was 195 gal.. The Vmax. was 110 mph, the landing velocity was 58 mph, and the service ceiling was 10,000′. The range was 385 mi. at maximum speed. Like the earlier Bat Wing, the wings of the ST-1 a trapezoidal, with curved wingtips. Twin vertical rudders are fitted, and the main landing gear is fix with a skid for the tail. Eddie Stinson, was the test pilot of the ST-1, which made its maiden flight on 25 April 1922. Five were on order. The Contract Number for the first 3 (A5899-A5901) was 55196 (Acquisition Number Aero 78 Bu-22). Confusingly, it states that a total of 5 were on order, even though BuAer numbers are given for only three aircraft in the official records. The aircraft was flown 14 times, but the contract was canceled when a U.S.N. pilot stalled the aircraft on take-off. The aircraft had cost $162,000.00 to build and stout was ruined by the accident. He is said to have called it: “The saddest day of my life.” Thus, the ST-1 became one of the great counterfactuals of aviation history. We can on wonder; “what if?” But. that’s not quite the end of the story. 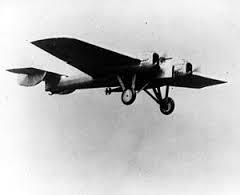 Stout Air Sedan AS-1 was powered with a 150hp Wright-Martin engine. After the crash of the ST-1, Stout raised more money to form a new company. Circulating a novel letter among wealthy industrialist, Stout promised no return on their money. What came next, was the 1-AS Air Sedan. This was the first Stout design that George Prudden was clearly involved with. Similar in appearance to the Bat Wing Limousine, the AS-1 was originally powered by Curtiss 90 hp OX-5. In due course, this was replaced with a 150 hp Wright-Martin. The aircraft could not carry more than three passengers with the OX-5, but 5 could be carried with the more powerful Wright-Martin. The airframe was covered with corrugated duralumin. The statistics remain unknown to this author, but a second machine, built for the post office, may hav existed as the Stout TT. Ford-Stout 2-AT Pullman, 1924, the first all-metal commercial passenger airplane built in the U.S. Following the Air Sedan, was Stout’s piece de resistance, the Air Pullman. Sometimes erroneously referred to as the 2-AT, Mr. Tom Towle stated in his article, Who Designed the Ford Trimotor 1, that Stout retroactively applied this designation to the Air Pullman to give the impression he had designed the Ford 4-AT Trimotor. In fact, the designations 1-AT, 2-AT and 3-AT, were used by John G. Lee, for early versions of what later became the Ford 4-AT Trimotor. Tom Towle, goes on to state that Stout deliberately began using the early designations to give the impression that they had led up to the Ford Tirmotor. In truth, Stout only made it as far as a freshman in college. A Stout drawiing kept by Towle, contains the note: “Engineers take it from here.” As it was, the Air Pullman was not the best of designs. It had a low-lift airfoil, which John G. Lee, presumed to be a NACA 81. It also used pressed duralumin for the engine mounts. On one occassion, an engine nearly fell off in flight. Working secretly with Maj. “Shorty” Schroeder, Towle designed a proper stee tube engine mount, for which he was promptly fired by Stout via George Prudden. The Air Pullman went through some alterations from prototype to production airplane. Fitted with the usual Liberty V-12, the aircraft was used as the basis to form Stout Air Services, the first regularly scheduled airline in the United States.. Like the Air Sedan, the Air Pullman was covered with corrugated duralumin. some were sold to Florida Airways, when Stout began flying timotors. Towle’s dismissal was short-lived. The odd organization of the Stout Metal Airplane Co., was described by Mr. John G. Lee, in an article which accompanied Tom Towle’s article in the Fall 1970 issue of The Journal of the American Aviation Historical Society. In any case, discussion of the Air Pullman, its terrible brethren, the trimotor Air Pullman, and how the Ford Trimotor evolved, is beyond the scope of this article. However, it has been noted that in the original Stout Metal Airplane factory, which was apparently deliberately burned, held a disassembled Junker-Larsen JL-6 which was kept in the rafters. Stout left Ford in 1930. Stout, is said to have also built an aircraft known as the SV-1 in the 1920s. Nothing is apparently known of this, however, he went on to build three aircraft which he named the Skycar I (Model 11W, 1931), Skycar II (1941), Skycar III tested by the USAAF as the XC-107), and the Skycar IV (also known as the Spratt-Stout Model 8). In his American Institute of Aeronautical Sciences application, Stout states that he built a stainless steel airplane in 1940, and that in 1935 he was president of the Society of Automotive Engineers. He was also involved with the all-aluminum Buckley LC-4. Stout was also involved in other curious activities. A November 1945 article from an unknown magazine refers to him as the; “Wizard of Dearborn,” states that he is sponsoring a contest (in connection with the Exchange Club of Syracuse) for the first person under the age of 18 to build a successful ornithopter. In 1943, an article in The Exchangite, states that he was Director of Research at Consolidated Vultee Aircraft. Indeed, the Convair Model 103 was the same aircraft as the Spratt-Stout Model 8, and in 1943 Stout sold Stout Engineering Laboratory to Consolidated Vultee. In 1932, Stout built the prototype Scarab automobile, looking vaguely like a Volkswagen Beetle. Nine were built, using an aluminum tube frame and a rear-mounted air-cooled engine. During the mid 1930s, Stout became involved with L,B. Kalb of Continental Motors to build lightweight engines for airplanes. During the 1940s, Stout began a project with Owen-Corning to build a car with unique suspension, push button electric doors and a frameless fiberglass body. Known as the “46,” only one was built. William Bushnell Stout held private pilot’s license #15232, and an F.A.I. Class “A” glider rating. He self-published a book of poems in 1936, and published an autobiography, titled: So Away I Went!, in 1951. He retired to Phoenix, Arizona, where he passed away on 20 March 1956, aged 76. 1. Some sources, such as; Who’s Who in American Aviation 1922, states that they were married in 1905. Most sources give the year as 1906. All sources agree on the day and month. 2. Stout’s response to a questionnaire apparently sent by the American Institute of Aeronautics and Astronautics. Angle, Glenn D. AIRPLANE ENGINE ENCYCLOPEDIA. Dayton, Ohio: Otterbein Press, 1921. Bowers, Peter M. FORGOTTEN FIGHTERS AND EXPERIMENTAL AIRCRAFT U.S. ARMY 1918-1941, VOL. 2. New York: Arco Publishing Co., 1971, pp 28, 32, 34 and 38-39. Bradford, Francis H. and Rice A. Dias. HALL-SCOTT: THE UNTOLD STORY OF A GREAT AMERICAN ENGINE MAKER. Warrendale, Pennsylvania: SAE International, 2007. Brockett, Paul, Ed. BIBLIOGRAPHY OF AERONAUTICS 1909-1916. Washington, D.C.: Smithsonian Institution, circa 1922, pp 411, 988, 1294 and 1385. Brooks, Peter W. ZEPPELIN RIGID AIRSHIPS 1893-1940. London: Putnam Aeronautical Books, 1992, pp 25-31, 52-55 and 187-188. Davies, R.E.G. AIRLINES OF THE UNITED STATES SINCE 1914. Washington, D.C.: Smithsonian Institution Press, 1972. Editors of the Automobile Quarterly. THE AMERICAN CAR SINCE 1775. New York: L. Scott Bailey, Publisher, 1971, p 436. Fahey, James C. U.S. ARMY AIRCRAFT (HEAVIER-THAN-AIR) 1908-1946. Falls Church, Virginia: Ships and Aircraft, 1946, pp 14-19. Friedman, Norman. NAVAL WEAPONS OF WORLD WAR ONE; GUNS TORPEDOS, MINES AND ASW WEAPONS OF ALL NATIONS, AN ILLUSTRATED DIRECTORY. Yorkshire, England: Seaforth Publishing, 2011, pp 341-342. Georgano, G.N. THE NEW ENCYCLOPEDIA OF MOTORCARS; 1885 TO THE PRESENT. New York: E.P. Dutton, 1982, p 558. Grey, C.G., Ed. JANE’S ALL THE WORLD’S AIRCRAFT 1919. New York: Arco Publishing, Inc., 1969, pp 473a-475a and 125b. ibid JANE’S ALL THE WORLD’S AIRCRAFT 1920. London: , 1920, p 296a. ibid. JANE’S ALL THE WORLD’S AIRCRAFT 1922. London: . 1922, p 192b. ibid. JANE’S ALL THE WORLD’S AIRCRAFT 1923. London: , 1923, p 207b. ibid. JANE’S ALL THE WORLD’S AIRCRAFT 1924. London: , 1924, p 245b. ibid. JANE’S ALL THE WORLD’S AIRCRAFT 1925. London: , 1925, pp 258b-259b. Grosz, Peter M. DORNIER D.I; WINDSOCK MINI DATAFILE 12. Berkhamsted, Hertfordshire, United Kingdom: Albatros Productions, Ltd., 1998.
ibid. JUNKERS D.I; WINDSOCK DATAFILE 33. Berkhamsted, Hertforshire, United Kingdom: Albatros Productions, Ltd., 1992.
ibid. JUNKERS J.I; WINDSOCK DATAFILE 39. Berkhamsted, Hertfordshire, United Kingdom: Albatros Productions, Ltd., 1993. Haddow, George W. and Peter M. Grosz. THE GERMAN GIANTS, THE GERMAN R-PLANES 1914-1918, REVISED EDITION. London: Putnam and Company, Ltd., 1969, pp 289-292. Hagerty, Jack and Jon C. Rogers. SPACESHIP HANDBOOK, ROCKET AND SPACECRAFT DESIGNS OF THE 20TH CENTURY: FICTIONAL, FACTUAL AND FANTASY. Livermore, California: ARA Press, 2001, pp 8-18 and 119-130. Ingells, Douglas J. TIN GOOSE; THE FABULOUS FORD TRIMOTOR. Fallbrook, California: Aero Publishers, Inc., 1968. Kay, Anthony L. JUNKERS AIRCRAFT AND ENGINES 1913-1945. London: Putnam Aeronautical Books, 2004, pp 11-39. Miller, Ron. THE DREAM MACHINES: A PICTORIAL HISTORY OF THE SPACESHIP IN ART, SCIENCE AND LITERATURE. Malabar, Florida: Krieger Publishing Company, 1993. Munson, Kenneth. PIONEER AIRCRAFT 1903-1914. New York: The MacMillain Company, 1969. National Committee for Aeronautics. BIBLIOGRAPHY OF AERONAUTICS 1917-1919. Washington: Government Printing Office, 1923, pp 313, 339-340, 425 and 461.
ibid. BIBLIOGRAPHY OF AERONAUTICS 1920-1921. Washington: Government Printing Office, 1925, pp 312, 392, 405 and 419.
ibid. BIBLIOGRAPHY OF AERONAUTICS 1922. Washington: Government Printing Office, 1925, p 150.
ibid. BIBLIOGRAPHY OF AERONAUTICS 1924. Washington: Government Printing Office, 1926, pp 54 and 102-103.
ibid. BIBLIOGRAPHY OF AERONAUTICS 1925. Washington: Government Printing Office, 1928, pp 63-64, 133 and 167. Neal, Robert J. A TECHNICAL & OPERATIONAL HISTORY OF THE LIBERTY ENGINE; TANKS, SHIPS AND AIRCRAFT 1917-1960. North Branch, Minnesota; Specialty Pres, 2009. Opdycke, Leonard E. FRENCH AEROPLANES BEFORE THE GREAT WAR. Altgen, Pennsylvania: SChiffer Military History, 1999, pp 181-182. Owers, Colin A. THE LEPERE LUSAC-11; WINDSOCK DATAFILE 120. Berkhamsted, Hertfordshire, United Kingdom: Albatros Publications, 2006. Rich, Doris L. THE MAGNIFICENT MOISANTS: CHAMPIONS OF EARLY FLIGHT. Washington: Smithsonian Institution Press, 1998. Rimell, Raymond. DORNIER FLYING BOATS; WINDSOCK DATAFILE 136. Berkhamsted, Hertfordshire, United Kingdom, 2009. Roland, Alex. UNDERWATER WARFARE IN THE AGE OF SAIL. Bloomington, Indiana: Indiana University Press, 1978, pp 80-82. Shamburger, Page and Joe Christy. COMMAND THE HORIZON; A PICTORIAL HISTORY OF AVIATION. New York: Castle Books, 1968., pp 155-167. Stroud, John. EUROPEAN TRANSPORT AIRCRAFT SINCE 1910. London: Putnam and Company, Ltd., 1966, pp 223-254, 293-306 and 357-362. Swanborough, Gordon and Peter M. Bowers, UNITED STATES NAVY AIRCRAFT SINCE 1911. Annapolis, Maryland; Naval Institute Press, 1976, pp 39-40 and 103-105. Wagner, Ray. AMERICAN COMBAT PLANES, NEW REVISED EDITION. New York: Doubleday, 1968, pp 320-322. Wegg, John. GNERAL DYNAMIC AIRCRAFT AND THEIR PREDECESSORS. Annapolis: Naval Institute Press, 1990, p 180. Woodman, Harry. JUNKERS MONOPLANES AT WAR; WINDSOCK DATAFILE 131. Berkhamstedt, Hertfordshire, United Kingdom: Albatros Publications, 2008. Aerial Age Weekly. V 2 N 12. December 6, 1915. Packard Company’s Practical Views of Preparedness, p 274.
ibid. V 2 N 20. January 31, 1916. The Packard Aviation Field, p 471.
ibid. V 2 N 23. February 21, 1916. Packard Field A Landing Place for Tourists, p 543.
ibid. V 2 N 25. March 6, 1916. Motor Expert Engaged by the Packard Company, p 593.
ibid. V 3 N 4. April 10, 1916. The Packard Aeronautical Engineer Off For Mexico, p 113.
ibid. V 3 N 8. May 8, 1916. Packard Twin-Six Tested, p 239.
ibid. V 3 N 14. June 19, 1916. The Packard Aviation Motor, pp 420-421.
ibid. V 4 N 21, February 5, 1917. Packard Aeronautic Motor Tested, pp 527 and 529.
ibid. V 4 N 22, February 12, 1917. Packard Aviation Engine, p 603.
ibid. V 11 N 18, July 12, 1920. The Packard Aero Engine Type 2025, pp 612-615.
ibid. V 12 N 17, January 3, 1921. The Stout Monoplane, pp 439-440. Aeronautical Engineering Supplement, The Aeroplane. V 15 N 24, December 15, 1920, The Stout Three-Seater Monoplane, p 910. Aeroplane. A New Stout Passenger Carrier. September 3, 1924. V 27 N 10, p 230. Autry, Peyton. The Radical, Brilliant Johnson Monoplane. Vintage Airplane. ibid. V 6 N 3, March 1, 1919. The Packard Aircraft and Engines, pp 146-150.
ibid. V 8 N 12, July 15, 1920. The Stout “Batwing” Monoplane, p 479.
ibid. V 8 N 9, November 8, 1920. The Stout Batwing Limousine, p 257.
ibid. V 11 N 1, July 4, 1921. The Packard Engine Test, p 21.
ibid. V 16 N 20, May 19, 1924. The Stout “Air Pullman,” pp 533-534. Businger, Ted. Logan McKee and the DeChenne Aeroplane. Vintage Airplane. July 1987, pp 18-19. Chirp, The Early Birds of Aviation. N 72. December 1964, p 10. The Dechenne Aluminum Airplane, etc. Aircraft. V 2 N 3, May 1911, p 85. Flight. No.387 V 8 N 21. May 25, 1916. Some American Aero Engines; The Packard 12-Cylinder Engines, pp 436-437. Flying. V 8 N 6, July 1919. Packard Establishes Flying Field, p 546. Grosz, Peter M. and Gerard Terry. The Way to the World’s First All-Metal Fighter. Air Enthusiast Quarterly No 25, August-November 1984, pp 60-76. JL. All-Metal Monoplane Described. Aircraft Journal V 6 N 20. June 28, 1920, pp 5-6. The JL-12 Armored Attck Plane. Aviation. V 11 N 19. November 7, 1921, p 538. The JL-12 Attack Plane. Aerial Age. V 14 N 9. November 7, 1921, pp 199-200. Johnson Brother Monoplane. Aero. Activity of Aviator and Builder. November 12, 1910, p 15. The Johnson Monoplane. Aircraft. V 2 N 9. November 1911, p 310. Johnson Monoplane is Good Flyer. Aero. V 2 N 26. September 30, 1911, p 555. Kelly Field Eagle. V 3 N 3, February 21, 1919, Monster “Stout” Monoplane Latest Airship Invention, p 5. Lee, John G. Who Designed the Ford Trimotor?, “2,” Journal of the American Aviation Historical Society. V 15 N 3, Fall 1970, pp 187-191. Logan McKee Seated in the DeChenne Aeroplane, etc. Aircraft. V 2 N 6. August 1911, p 205. Machine Recently Built by the Holbrook Helicopter Aeroplane Co. of Monnett, Mo. Aircraft. V1 N 6. August 1910, p 225. Moisan. Le Monoplane Moisan a Issy. La Revue Aerienne. 5 annee No. 39, 1 er. Fevier 1910, p 34. Moisan. Le nouvel aeroplane de M. John Moisan. L’Aerophile. 15 e annee, No. 11, 1 Juin 1910, p 243. Moisant. L’Appareil Moisant a Issy. La Revue Aerienne. 5 e anne No. 43. ! er Juin 1910, p 137. Moisant, John B. The Alumino-plane. Aero. No. 2 V 55, June 7, 1910, p 459. The John Moisant Monoplane. Aero V 2 N 36. January 25, 1910, p 64. A New Metal for Aeroplane Construction. Scientific American. V 104 N 4. January 28, 1911, p 101. Preservation Profile No. 42, Junkers F-13. Aeroplane Monthly. October 1976, V 4 N 10, pp 550-551. Remarkable Performance of JL-6 Monoplanes on Transcontinental Trip. Aerial Age. V 12 N 1. September 13, 1920, p 20. Skyways No. 12. October 1989. Junkers-Larsen JL-6, pp 22-27. Skyways No. 24. October 1992. Junkers-Larsen JL-6/F-13, pp 34-35. The Stout Air Pullman, America’s First All-Metal Commercial Plane, Built in Detroit, PassesPasses Successful Flying Tests. Flight. October 16, 1924, V 16 N 42, pp 668-669. Stout, William B. Duralumin, its Characteristics and Use. Aviation, V 11 N 16. October 17, 1921, pp 455-456.
ibid. Duralumin: Its Properties and Commercial Possibilities. Aerial Age, V 14 N 5. October 10, 1921, pp 105-106.
ibid. The Internally Trussed Wing. Aviation, V 10 N 7, February 14, 1921, p 200.
ibid. Wood Versus. Metal for Airplanes. U.S. Air Services, V 8 N 5, May 1923, pp 16-17. Stroud, John. Junkers F 13, The Pioneer from Dessau. Air Enthusiast Quarterly No. 16, 1981, pp 66-77. Taylor, H.A. Ford’s Stout-Hearted Trimotor. Air Enthusiast 8, 1978, pp 38-50. Towle, Tom. Who Designed the Ford Trimotor?, “1,” Journal of the American Aviation Historical Society, V 15 N 3, Fall 1970, pp 181-186. Vincent, Jesse Gurney. The Packard Twin-Six. Aerial Age Weekly, V 3. N 7, May 1, 1916, p 211.
ibid. Aviation Engines. Aircraft, V 6 N 12, July 1916, pp 592-593; and Aerial Age Weekly, V 3 N 18, July 17, 1916, pp 532-533.
ibid. Steps in Liberty Engine Development. Automotive Industries, V 38 N 3, January 17, 1918, p 160.
ibid. Special Packard Aero Engine for Altitude Work. Aerial Age, V 12 N 25, February 28, 1921, pp 631-633, 643.
ibid. An American Engine for Altitude Work. Aviation, V 10 N 9, February 28, 1921, pp 260-262.
ibid. Jesse Gurney Vincent. Aerial Age Weekly. V 13 N 4 April 4, 1921, p 85. Weal, John. Dr. Dornier’s Great White Wal. Air Enthusiast No. 13, August – November 1980, pp 1-12. Wright, George E. Jr. The Schwartz All-Metal Airship System 1893 – 1897. Journal of the American Aviation Historical Society, V 14 N 3, Fall 1969, pp 166-168. A New Zeppelin Staaken Monoplane. Aviation. V 11 N 18. October 31, 1921, p 505. The Zeppelin Staaken All-Metal Monoplane. Flight. N 638, V 13 N 11. March 7, 1921, pp `185-186. The Zeppelin Stakken Giant Monoplane. Aeronautical Egineering Supplement, The Aeroplane. V 19 N 24. December 15, 1920, pp 906, 908. The Zeppelin Staaken 1,000 – Horsepower Monoplane. Aviation. V 11 N 14. October 3, 1921, pp 389-401.
ibid. V 5 N 360. Junkers F-13. Chief of the Air Service. Washington, 1922. Engineering Division, Air Service. Technical Orders No. 9, October 1919. Junker All-Metal Monoplane, pp 123-125.
ibid. Technical Orders No. 16, May 1920. Standard Engine Report on Packard 1A-744 Aviation Engine, pp 16-55.
ibid, Technical Orders No. 17, June 1920. Standard Engine Report on Packard 1A-1116 Aviation Engine, pp 27-65. Library of Congress, Manuscript Division. American Institute of Aeronautics and Astronautics, Box 118; Biographical Information on William Bushnell Stout. Neal, Robert J. Statistics of All Engines of Packard.